3-Alma Rachael Walker was born on 10 Apr 1886 in Westbury, Tasmania and died on 28 Oct 1977 at age 91. 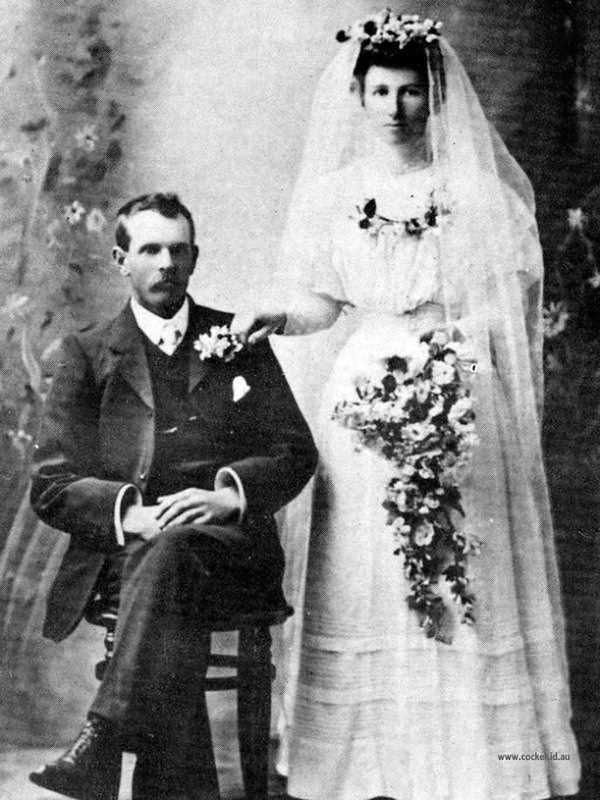 Alma married Robert Stewart Arundle Jarman, son of Josiah Jarman and Elizabeth Stuart Galloway, on 24 Jun 1908 in Parkham, Deloraine. Robert was born on 24 Feb 1884 in Parkham, Deloraine and died on 21 Oct 1946 in Hobart, Tasmania at age 62. 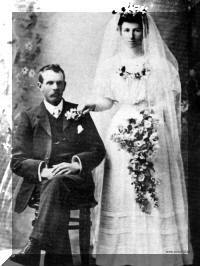 Alma Rachael married Robert Stewart Arundle Jarman of Elizabeth Town in June 1908 by the Rev. Delbridge. She became a very good housekeeper and the mother of two daughters and one son. Arundle Jarman was a good, active farmer. He also had horses, a mower and binder with which he cut crops of wheat, oats and barley for other farmers in the Parkham district and carted the grain to the Deloraine Grain Mill. He also contracted to cut and supply sleepers to the Government Railways. When in 1930 the family moved to Wattle Bank, Deloraine, Arundle continued contracting with his horses and binder, and later built a home in Parsonage Street. Their next move was to Westbury where he bought a farm in Selbourne Road. Because of his failing health, Arundle's son was released from the Army to help run the farm. In 1946 he died in hospital in Hobart. Alma stayed on the farm for some years. She later sold and moved to Devonport where she took up housekeeping before buying her own home and retiring there. 4-Florrie Azalia Jarman was born on 15 May 1909 in Parkham, Deloraine. Florrie married Vivian Henry Smith, son of John Robert Smith and Edith Emma French. Vivian was born on 22 Jul 1906 in Deloraine, Tasmania and died on 27 Feb 1975 at age 68. They had one son: Graham Ronald. 5-Graham Ronald Smith was born on 6 Feb 1936. Graham married Kathleen Lovegrove. Kathleen was born on 18 Dec 1941. They had two children: Paul Anthony and Michelle Anne. 6-Paul Anthony Smith was born on 6 Oct 1967. 6-Michelle Anne Smith was born on 20 Nov 1969. 4-Doris Lottie Jarman was born on 17 Jun 1912 in Parkham, Deloraine and died on 18 Feb 1980 at age 67. Doris married Herbert Elvin Vertigan, son of Elvin Baxter Vertigan and May Knight. Herbert was born on 18 Apr 1912 in Ulverstone, Tasmania. They had two children: Marleen and Beven. 5-Marleen Vertigan was born on 18 Nov 1938. Marleen married Donald Smith. Donald was born on 28 Mar 1938. They had two children: Garry and Ross. 6-Garry Smith was born on 3 Sep 1962. Garry married Judy Anne Rankin. They had one daughter: Rebecca. 7-Rebecca Smith was born in 1984. 6-Ross Smith was born on 4 Oct 1966. 5-Beven Vertigan was born on 8 Apr 1942. Beven married Cecily Bratt. Cecily was born on 15 Apr 1942. They had five children: Martina, Damien, Mathew, Kathleen and Anthony. 6-Martina Vertigan was born on 6 Apr 1970. 6-Damien Vertigan was born on 27 Jul 1972. Damien married Shabrone Godman. 6-Mathew Vertigan was born on 11 Apr 1974. 6-Kathleen Vertigan was born on 9 Nov 1977. 6-Anthony Vertigan was born on 8 Mar 1981. 4-Cecil Robert Jarman was born on 12 Dec 1918 in Parkham, Deloraine. Cecil married Dorothy Evelyn Jones. Dorothy was born on 22 Jan 1921, died on 4 Feb 2005 in Mersey Community Hospital, Latrobe at age 84, and was buried on 8 Feb 2005 in North West Regional Creamtorium, Ulverstone. They had three children: Allan Guy, Margaret and Lynette Dawn. 5-Allan Guy Jarman was born on 11 Jun 1943 in Naldera Private Hospital, Launceston. Allan married Pamela Preece. Pamela was born on 3 May 1949. They had two children: Naomi and Kent. 6-Naomi Jarman was born on 9 Dec 1970. 6-Kent Jarman was born on 14 Aug 1972. 5-Margaret Jarman was born on 11 Jun 1945. Margaret married Desmond Watson. Desmond was born on 18 Sep 1943. They had three children: Carolyn, Timothy and Craig. 6-Carolyn Watson was born on 8 Jun 1964. Carolyn married Steven Degetto. They had one son: Cody Alistair. 7-Cody Alistair Degetto was born on 13 Jun 1992. Carolyn next married Craig Andrew James Skipper on 27 Jan 1985. Craig was born on 1 Jul 1963. 6-Timothy Watson was born on 24 Oct 1969. 6-Craig Watson was born on 13 Mar 1970. Margaret next married Alf Elmer. 5-Lynette Dawn Jarman was born on 27 Oct 1948 in Arcoona Hospital, Deloraine and died on 28 Dec 2007 at age 59. Lynette married Keith Lennard. Keith was born on 18 Jun 1943. They had two children: Gregory and Janine. 6-Gregory Lennard was born on 6 Jul 1970. 6-Janine Lennard was born on 6 Jun 1972.